CLEVELAND (AP) LeBron James knows about the narrative bouncing around the NBA that Cleveland can be dethroned in the East. He’s ignoring it, and slowly changing it. Just to make sure everyone understood him, James asked his two sons waiting for him in Cleveland’s locker room to chime in on whether he was concerned about outside voices. The boys had dad’s back. 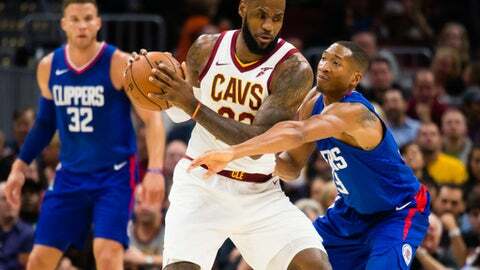 James had another of those games that he only seems capable of, scoring 39 points with 14 rebounds in 46 minutes as the Cavaliers continued to improve from a shaky start with their fourth straight win, 118-113 in overtime on Friday night over the skidding Los Angeles Clippers, who dropped their seventh in a row. Kevin Love scored 25 and drained a pair of 3-pointers in OT, when the Cavs, who didn’t take the lead until the first minute of the extra session, outscored the Clippers 13-8. Dwyane Wade gave Cleveland a huge spark, scoring 23 points with 11 rebounds in 37 minutes. The Cavs’ win wasn’t eye-pleasing, but it was another step in the right direction for the three-time defending conference champions, who went 3-1 on a just-completed road trip. On Thursday night, James said he watched Boston beat Golden State to improve to 14-2, a stunning start that has prompted discussion about Cleveland’s vulnerability. James dismissed any concern about the Celtics’ early burst. ”I’ve got too much to worry about around here right now trying to get our ship going in the right direction,” he said. The Clippers’ ship is taking on water fast. Los Angeles has lost nine of 10 since a 4-0 start. Blake Griffin scored 23 and DeAndre Jordan had 20 points and 22 rebounds for Los Angeles, which didn’t give up the lead until the first minute of overtime. The Clippers had chances to put the Cavs away in regulation, but they didn’t execute down the stretch and then had defensive breakdowns in overtime. The Cavs spent all night chasing the Clippers and caught them at 105-all when Love grabbed an offensive rebound and fed James, who dropped an uncontested 3-pointer with 47 seconds left. Griffin missed tough shots on consecutive possessions, giving Cleveland one last chance in regulation but James missed an off-balance left-hander just before the horn. James made a free throw to open OT – he went 1 of 5 at the line – and give Cleveland its first lead. Then, after Love made his two 3s, James sealed the Cavs’ fifth win in six games with a jumper. Cavaliers: PG Derrick Rose will miss at least two more weeks with a nagging left ankle injury. Rose’s ankle will be immobilized in a boot for the next week and he could undergo treatment for as many as three more weeks. … Iman Shumpert started again at point, but left in the first quarter a sore left knee and didn’t return. … G Jose Calderon played his first minutes since Nov. 1. … Working toward his return from a hip injury, G Isaiah Thomas got in two on-court workouts before the game. … Cleveland has won 33 of its last 39 home games against Western Conference teams. Wade’s aggressiveness in the second quarter helped the Cavs shake off an atrocious start. Down 10 points, Cleveland chipped away and despite some defensive lapses, the Cavs somehow tied the Clippers 56-all at halftime. Wade scored 17 in the quarter, 11 on free throws, as he was able to draw fouls with drives and extra-effort plays. Clippers: Continue road trip on Saturday in Charlotte. Cavaliers: At Detroit on Monday.